This heartfelt revue tells the true story of the country music legend’s unlikely friendship with a fan, Louise Seger, cemented by years of letter-writing. 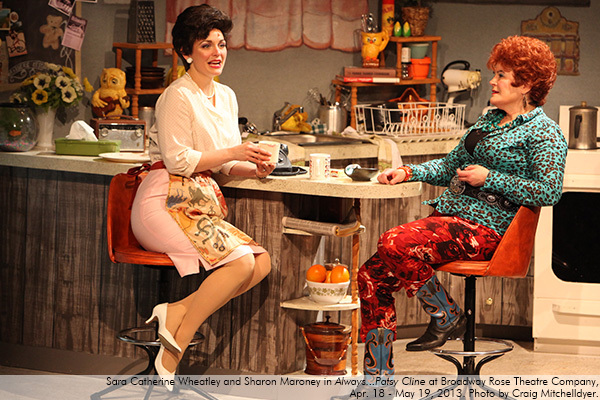 Featuring many of Cline’s timeless hits such as “Crazy,” “I Fall to Pieces,” and “Walking After Midnight,” Always…Patsy Cline returns by demand after a sold-out run in 2009, with Sharon Maroney as Louise and Sara Catherine Wheatley reprising the title role. 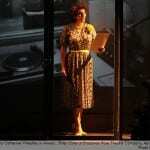 Performance run time is 2 hours, including one 15-minute intermission. 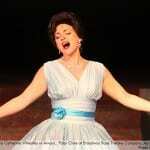 Sara Catherine Wheatley (Patsy Cline) is pleased to be reviving the role of this country music legend once more. 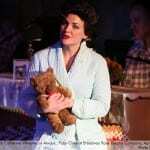 She played the role at Broadway Rose in 2009 and in Alabama in 2005. 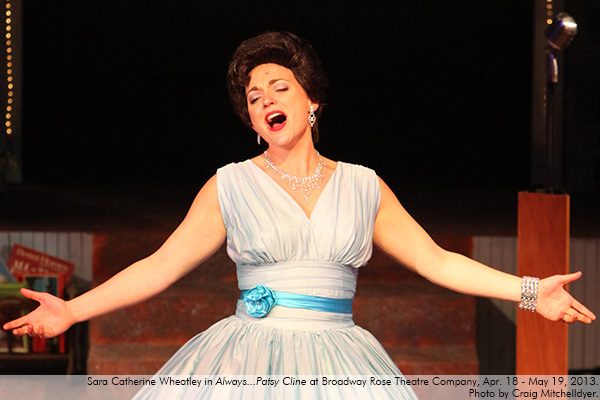 An Alabama native, Sara Catherine received her B.A. in Theatre from the University of Alabama (Roll Tide! ), and her education in country music from singing along to old coal-miner tunes with her Daddy and blasting the local country station with her high school girlfriends. 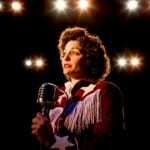 She found her love for Patsy Cline at an early age, and has always dreamed of being a country star. Her dreams are coming to fruition with the help of Eric Holder and their Rock Country duo, The Lucky Ones (www.TheLuckyOnesMusic.com). By mixing Holder’s energetic rock guitar with Wheatley’s classic country twang, these two have no where to go but up. Recent theatre credits include: The Drowsy Chaperone (Kitty), and Hairspray (Velma VonTussle) at the Broadway Rose; The 25th Annual Putnam County Spelling Bee (Olive; Drammy Award Winner), One Flew Over the Cuckoo’s Nest (Candy Starr), and Ragtime (Mother Understudy/ Ensemble) at Portland Center Stage; (I am Still) The Duchess of Malfi (Duchess) at Artists Repertory Theatre; Annie Get Your Gun (Annie Oakley; Drammy Award and OTAS Winner), and The Producers (Ulla; OTAS Award) at Lakewood Theatre; and most recently Bloody Bloody Andrew Jackson (Naomi) at Portland Playhouse. 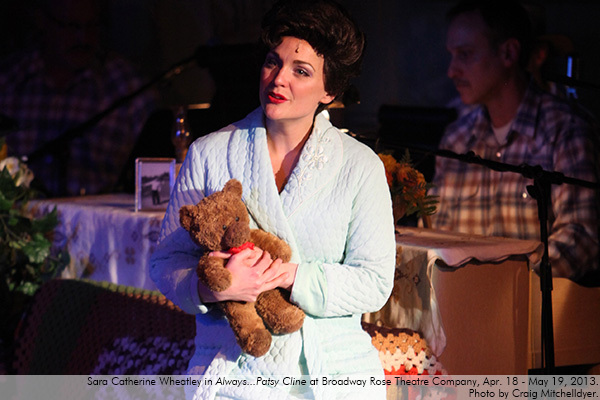 Sara Catherine is always thrilled to be onstage at Broadway Rose and gives her love and gratitude to Dan and Sharon. 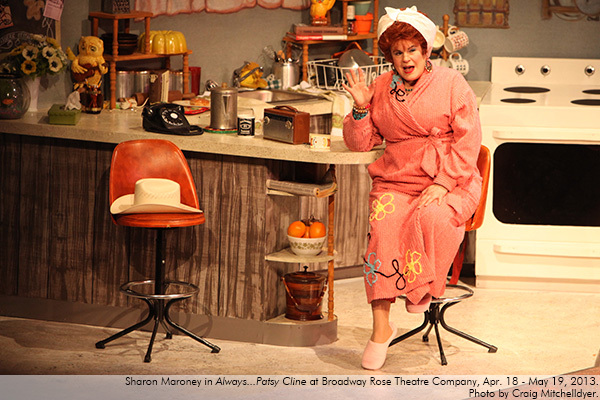 Sharon Maroney (Louise Seger) Co-founder and Producing Artistic Director Sharon Maroney was last seen onstage at Broadway Rose in Pump Boys and Dinettes. 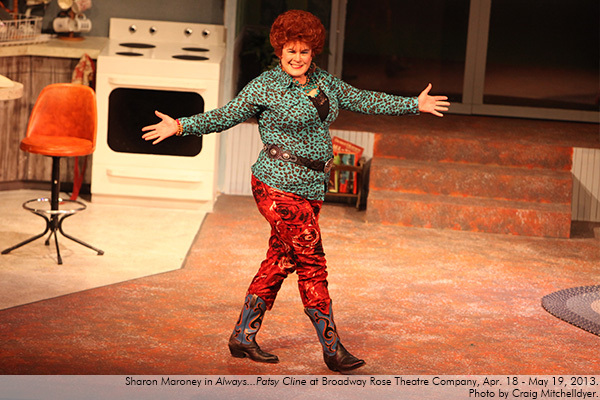 Sharon has enjoyed playing Angela in Honky Tonk Angels, Muriel in Dirty Rotten Scoundrels, and Louise in Always…Patsy Cline (2009) at Broadway Rose, and Dolly in Hello, Dolly! 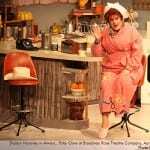 at both Broadway Rose and Lakewood Theatre Company. 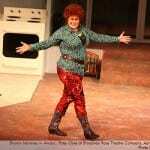 Her favorite past roles include Keely in Pete ‘n’ Keely and performing in Forbidden Broadway for triangle productions! 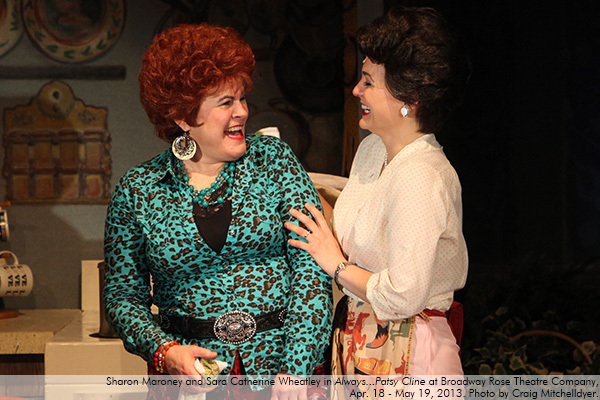 Sharon is still married to Dan Murphy (founding general manager), that “curtain speech guy,” and is looking forward to directing My Fair Lady at Broadway Rose this summer. 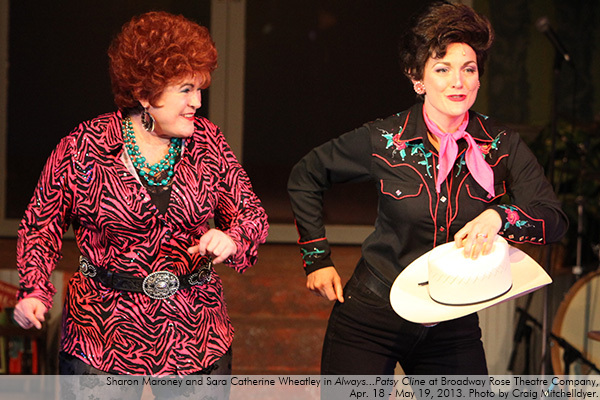 Based on a true story, the musical is carried just as much by Sara Catherine Wheatley’s flawless, crooning vocals as Patsy Cline as it is by Sharon Maroney’s entertaining and comedic narration as Louise, with the events broken up by classic Cline songs…Read more here. Wheatley, an Alabama native, captures the unforgettable Cline vocals with eerie accuracy, the velvety alto range, the hint of sob in the voice, like a stab of pain...Read more here. 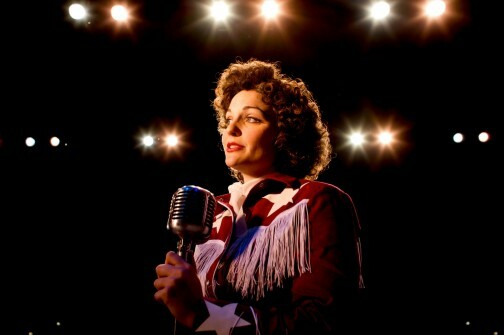 Two immensely talented actresses working their hearts out to entertain, backed by a solid country-swing band, playing to a packed house…Read more here. 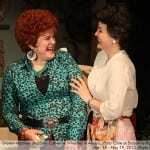 …Patsy is the role she was born to play. 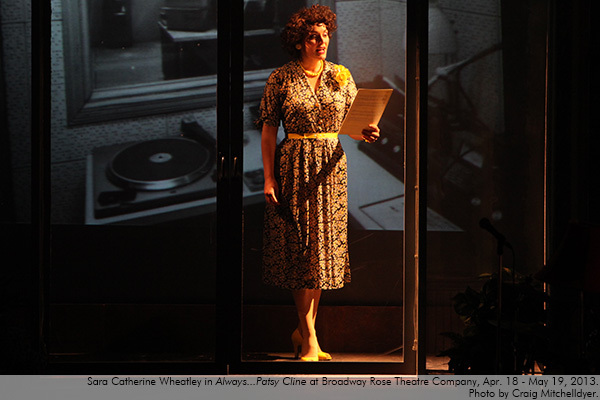 Wheatley’s vocal ability and stage presence recreate the magic that can only be experienced when a first-rate performer is seen live…Remarkably, Wheatley achieves this without overt imitation – her vocal style, while reminiscent of Cline’s, is distinctly her own...Read more here. 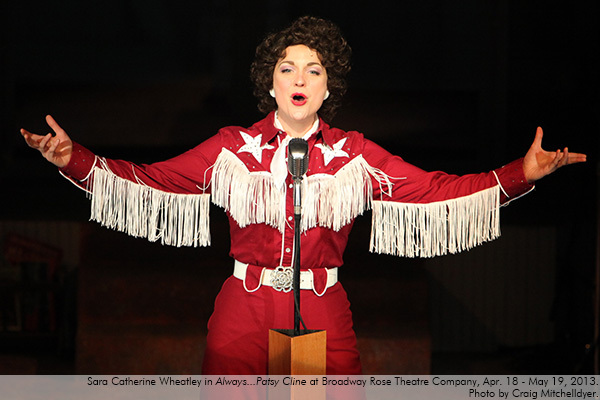 Sara Catherine Wheatley is the living image of the late, great Patsy Cline when she dons the outfits, wigs and makeup, so it is only natural she is playing Cline for the third time in her life in Broadway Rose Theatre Company’s production of “Always…Patsy Cline.” Read more here. 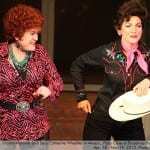 The unlikely friendship between country music legend Patsy Cline and her fan Louise Seger is proof that not all fan mail goes unanswered…Read more here.